Drying oven / Tray Dryer is specially designed for Pharmaceuticals, Food, Chemicals, Paints, Textiles & other industries. It is well accepted for economical drying of granules, powder , food material & chemicals. Tray Dryer / Drying oven is fabricated out of rigid angle iron frame with double walled panels insulated with best quality compressed fibre glass and with a rigid door fitted with strong hings and best chosen locking arrangement. A control panel is fixed in front of the oven to facilitate the operation easily. It has a large working space and is available, manufacturing from mild steel & in good finishing outside with synthetic enamel color & inside painted with heat resistant paint to resist temperature up to 300 degree, in Standard Model. It is also manufacture completely from SS304 or SS316 ( As per customer requirement ) in GMP Model & polished to the mirror finish from inside & Matt finish from outside. 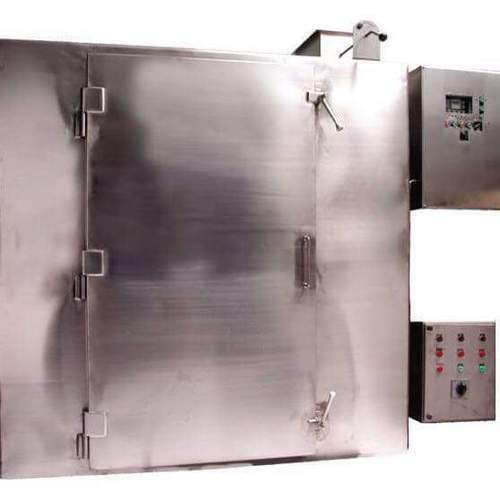 The Drying ovens are normally available with choice of heating mode, as electrically heated / steam heated & thermic fluid heated.. In electrically heated model, digital temperature controller provided with digital timer to facilitate working day and night. In steam & thermic fluid heated model, digital temperature indicator is provided with digital timer, but the temperature controller is not supplied with the machine. Digital temperature controller with digital timer are supplied in Tray Dryers to facilitate working day and night. Option : Flame proof fittings and motor. S.S.304 / S.S. 316 Trays. Application : Tray Dryers are widely used in Pharmaceutical, food, chemicals and other industries. Innovation is our forte and we strive hard to design and develop a comprehensive range of Tray Dryers. Manufactured from thick mild steel sheets, these dryers are has a fresh air inlet through the filter and an adjustable air outlet with a door at the front. Trays will be manufactured from 1.6 mm SS 304 sheets.Its dimensions are 32" x 16" x 1 l/4"